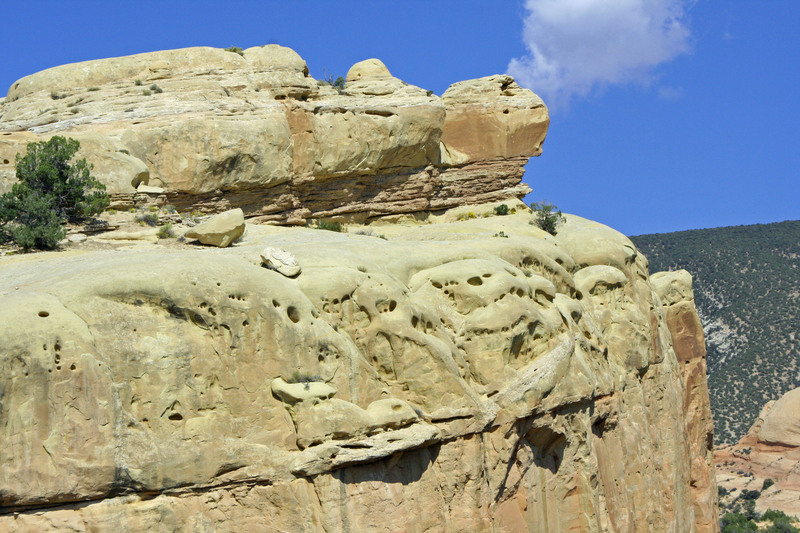 Like much Indian rock-art, Cub Creek petroglyphs in Dinosaur National Monument raise intriguing questions. It would be fascinating to know the story behind this unique anthropomorphic figure. What do the lines stretching toward the sky represent? Peggy and I crossed over the Green River in Dinosaur National Monument and followed the road toward the cabin of Josie Basset Morris, the tough old pioneer woman who had worked her way through five husbands and finally discovered she preferred living alone. The river, mountains and distant vistas entertained us along the way. Two prominent landmarks, Elephant Toes and Turtle Rock, lived up to the names the early settlers had bestowed on them. I found the big toes particularly amusing. Elephant Toes Rock in Dinosaur National Monument along the Cub Creek Road. 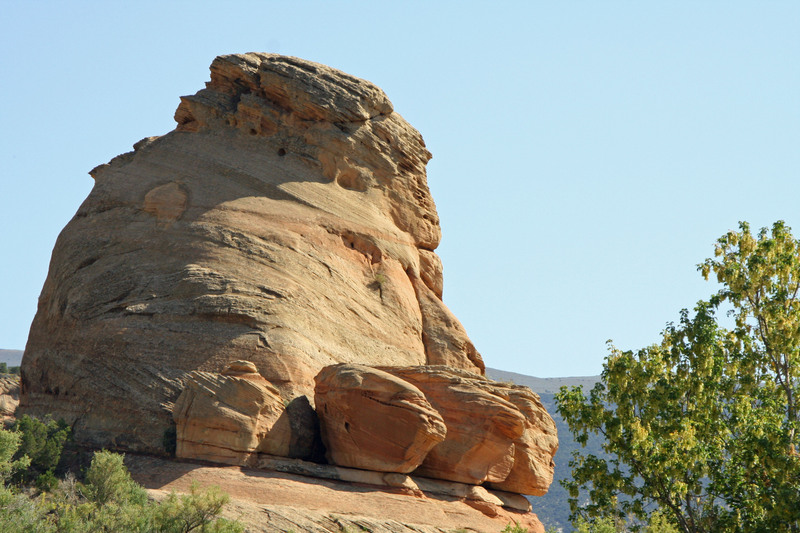 While not as humorous as Elephant Toes, the turtle of Turtle Rock is easy to see. 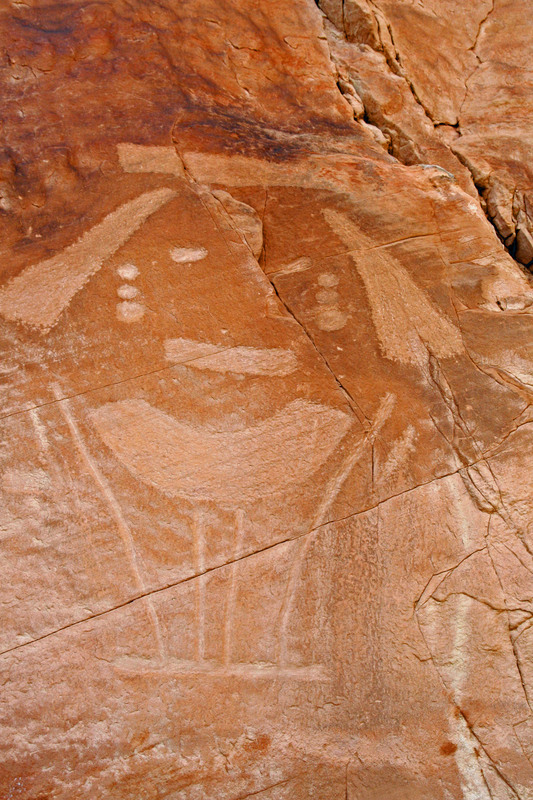 Both Native Americans and pioneers were quick to see and name familiar figures in the landscape. The true surprise on our way to Josie’s, however, was the Indian rock-art. 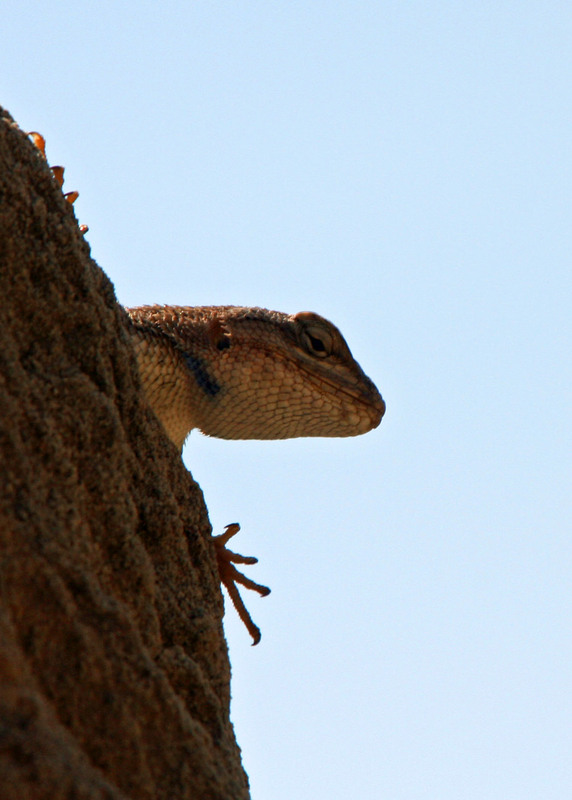 Huge six-foot lizards had been pecked into the cliff faces high above the Cub Creek Valley. One can only wonder if the Native Americans of the Fremont Culture had somehow made the correlation between dinosaur bones found throughout Dinosaur National Monument and really big lizards. Or did small lizards so prominent in desert environment serve as the models? 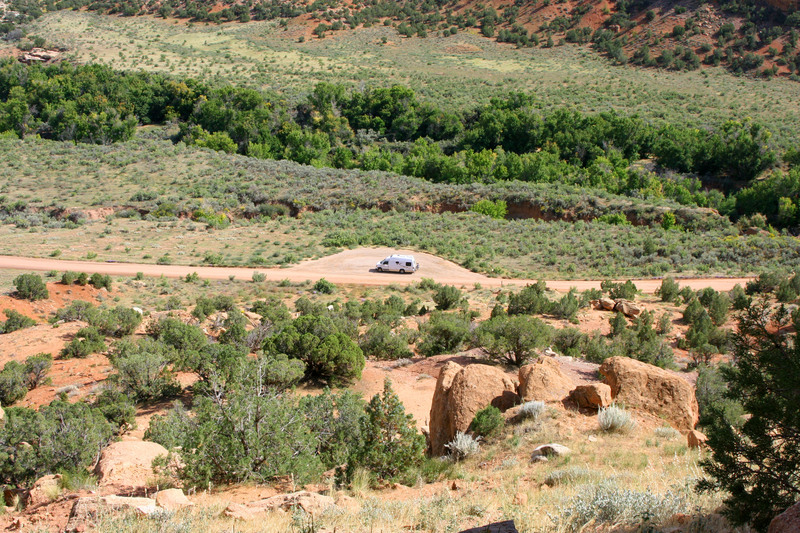 Our van, Quivera, provides perspective on how high up in the cliffs the Cub Creek petroglyphs are. 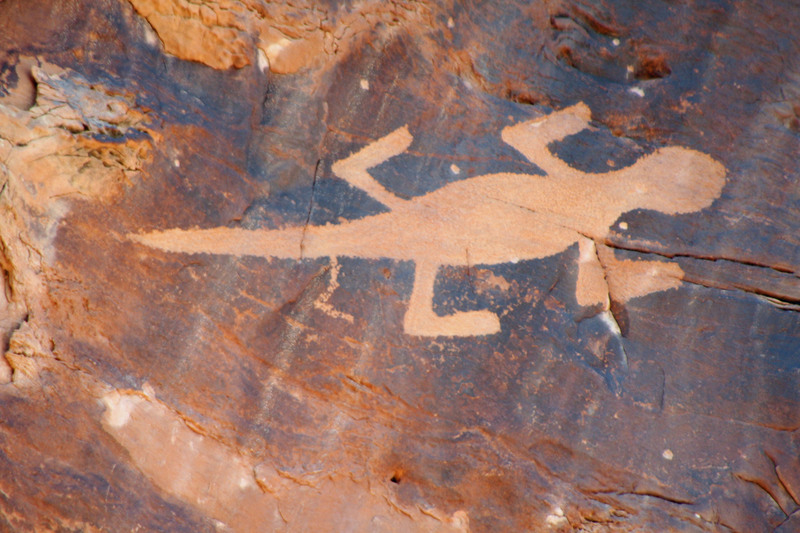 Giant, six-foot long, rock-art lizards work their way up the rock face at Cub Creek. Are they representative of the dinosaur bones Native Americans found at Dinosaur National Monument? 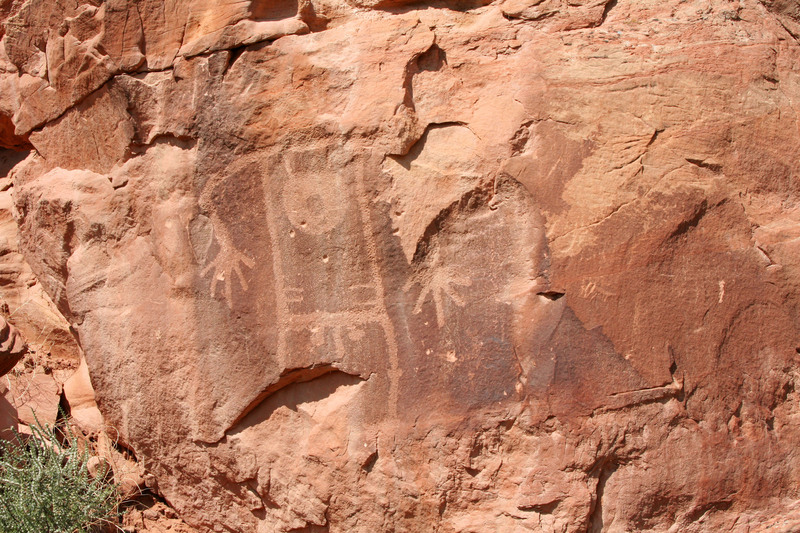 Or did the giant petroglyph lizards represent the small lizards so prominent in the arid regions of the West? Numerous other petroglyphs also demanded our attention. 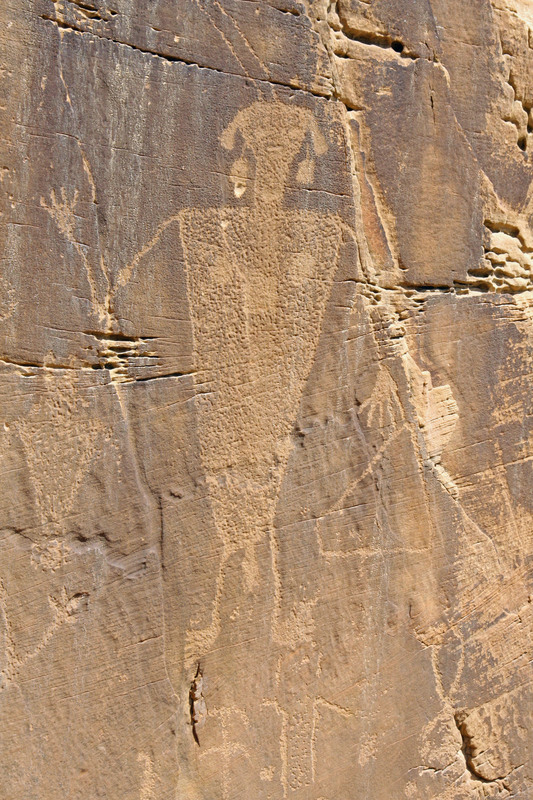 We even found a partial image of Kokopelli, the hunch backed flute player found in ancient rock-art from Mexico to Canada and whose image has been applied on everything from jewelry, to blankets, to pottery in today’s gift shops throughout the West. Kokopelli was both a musician and trickster god, but mainly he was a fertility deity known for his for his bad behavior. Watch out fair maidens one and all. 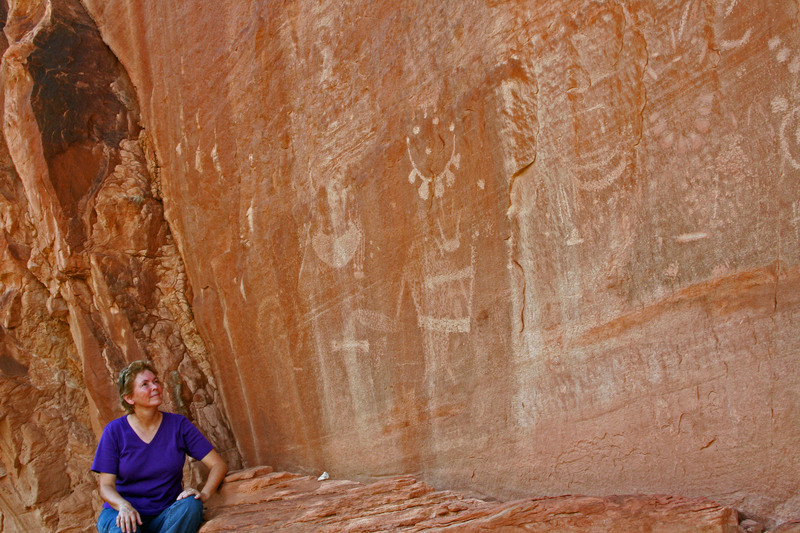 My wife Peggy admires a small section of the numerous petroglyphs found at the Indian rock-art site on Cub Creek in Dinosaur National Monument. 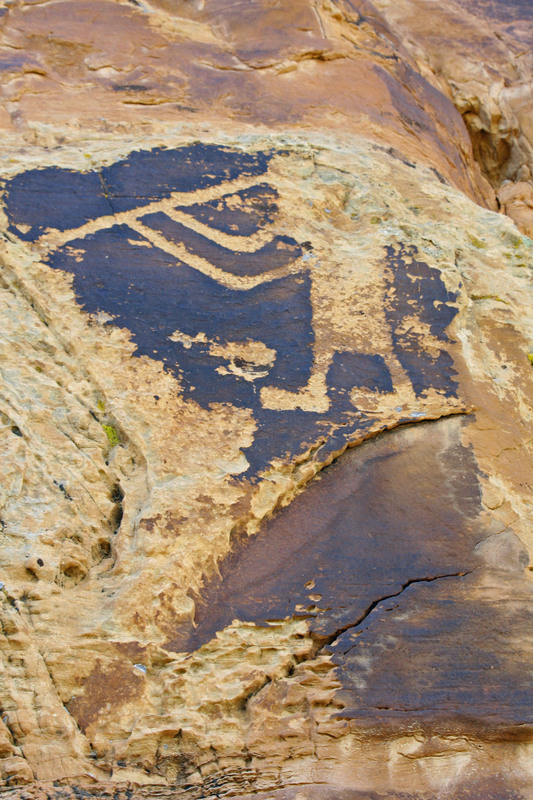 A partial petroglyph of the flute playing Kokopelli is found at the Cub Creek Indian rock-art site. Odds are he is luring young maidens with his music. 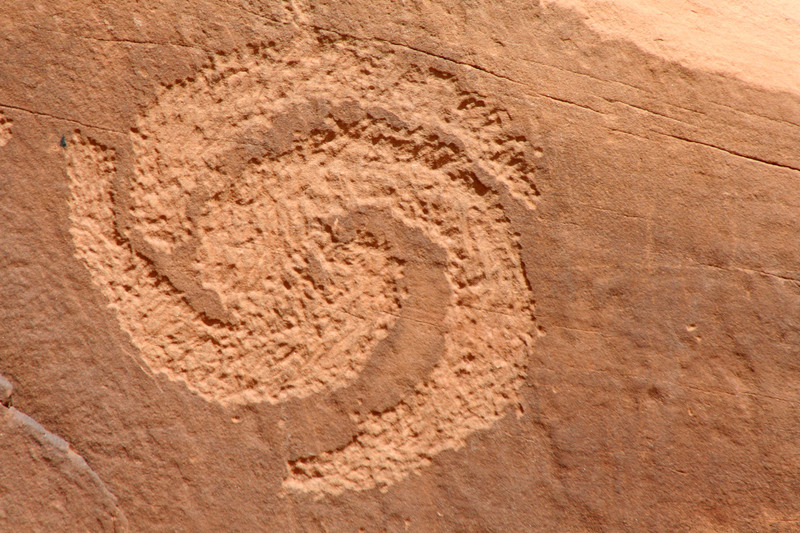 Geometric forms are common in rock-art. This galaxy-like representation caught my attention. I selected this particular photo because it demonstrates how dark rock varnish has been chipped away in the petroglyph process to reveal the lighter colored rock underneath. An early day smiley? This guy appears to me to be all mouth and legs but it’s creator likely had something else in mind. Greetings Earthlings. Check out the dangling ear rings and necklace on this guy. Jewelry apparently was quite important to early Native Americans and may have represented an individuals importance or clan. You will probably note the prominent anatomy as well. Genitalia was often included on Indian rock-art until the Spanish Missionaries informed the natives that such display was sinful. 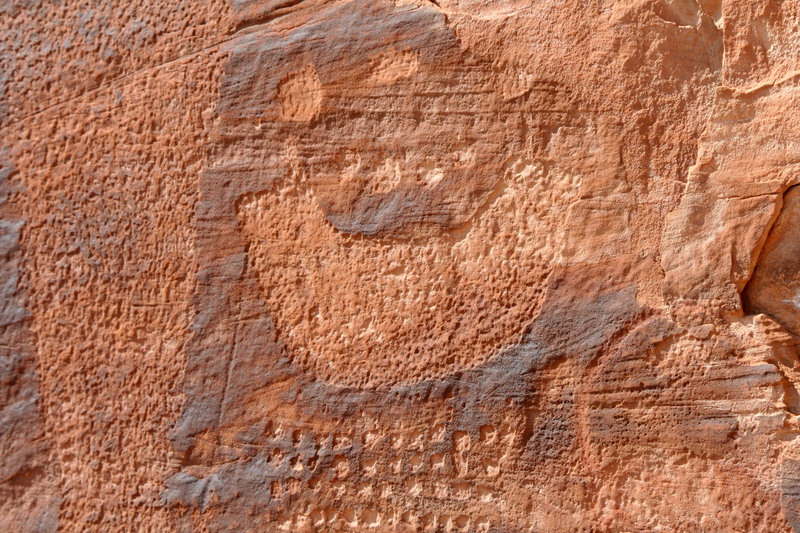 I call this petroglyph Big Boy. Beautiful artwork… I’d love to see this in person. This is amazing. One could wonder about these things for a long time and never really quite know. Love the photos. I confess Val that part of the fascination is in the not-knowing… or as you put it, the wonder. 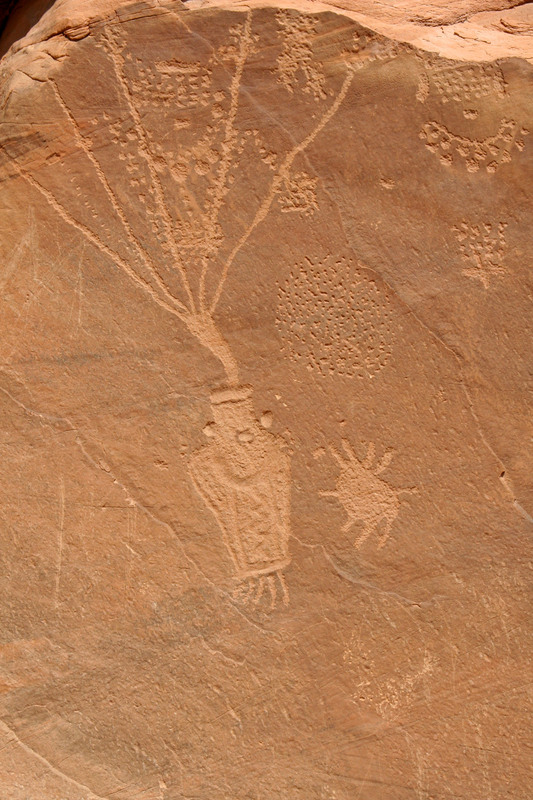 I will be blogging about Newspaper Rock later this week… one of the best known rock art sites. Thanks for visiting. It was amazing to me as we traveled through this area, how few visitors there were. Part of the intrigue is not only the art but also the feeling of isolation…the imagination does run wild! Having fewer folks is one of the advantages of traveling off season. The only petroglyph site we have visited with more than one or two other people was Newspaper Rock.